I had to get away the other night. I could sense myself becoming overwhelmed with too much to do in too little time, finding myself irritable towards my husband, and willing Baby to please stop pushing into my hip. So I ran away to the (very unfinished) nursery. I sat against the back wall staring at baskets of new clothes, piles of folded blankets and burpers, and boxes with unbuilt furniture waiting to be diligently put together. I wanted to close my eyes and open them to a finished room. I wanted my husband to come back there with his toolbox and just start working on it. I wanted to hang up the curtains myself just so I could feel like something was accomplished. Baby isn't even here yet and I'm trying to figure out how I am going to balance it all: marriage, a clean home, dinners, working full-time, parenting, and of course, my own needs. Which one is going to have to give? 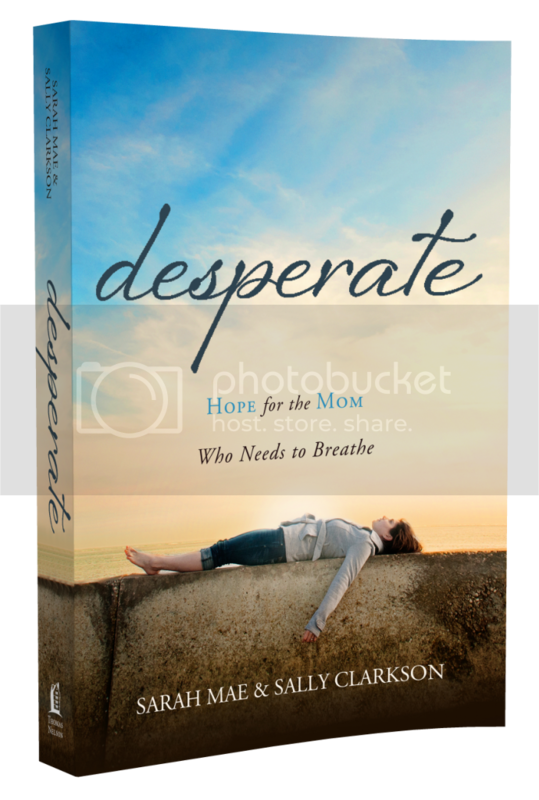 Sarah Mae and Sally Clarkson recently co-wrote a book, Desperate. Written for mothers who feel just that - desperate - they touch on each of these topics with such honest grace. What do we do when we find ourselves selfish? What do we do when we don't feel like being a mother today? What do we do when we just want to run away? I had the opportunity to receive an advance copy of this book to review. As a soon-to-be mother, I wasn't sure how applicable it would be. After all, the only parenting I've done so far is through force-feeding my unborn child whatever it is that I eat and nudging it here or there to make myself more comfortable. The tables will be turning soon. But through reading this book at night curled up with my seventeen pillows, I felt lightened. I felt that whatever comes my way has come to others as well. Others have felt overwhelmed, unaccomplished and at a dead end. And it's okay. God has made me a mother. He has made me a mother to this specific child. He isn't going to abandon me now. If you're a mother now or will be a mother soon, I know this book will bless you in your journey. Click here for more information on the book, to enter fun giveaways, and to purchase a copy for yourself! Sounds like a great read. Remember to make To Do List for Chris as well as yourself. He does not read your mind and expectations not voiced can never be met. Babies don't care about decorated nurseries....only Type A mamas do.